A sickening act of terrorism in the streets of Paris and the assassination of a politician appear at first to be unrelated. Charged with finding out who is behind the attack, the emotionally fragile Commander Pauline Rougier of the Counter Terrorist Brigade discovers that the two incidents may not be so far removed, as a looming civil war threatens to catapult the country into chaos. Meanwhile, troubled yet charming New York Times journalist Jack Campbell and his friend, computer genius Thomas Delvaux, have uncovered an international conspiracy could reshape the global balance of power. Middle eastern oil money, shady Swiss banks and hyper-advanced artificial intelligence, Jack and his connections are led to Paris as they try to find out who, or what, is behind it all. Will Jack and Pauline be able to combine their talents and put a stop to the wheels of doom before they are set in motion? Will these two tortured souls be able to put their own feelings to one side as they work to protect the global status quo? My novels express the fears that our society impose on us. As a novelist , I build thriller intrigues that are a common thread that I use to denounce the evils of our time . 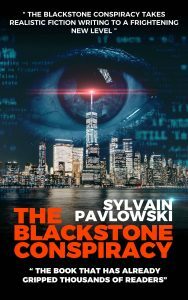 In my first thriller ,“The Blackstone Conspiracy”, I chose to describe the disproportionate risks that finance is hovering over our societies and how Artificial Intelligence can become a danger in the near future. As an author I use a recurring character as an instrument to express my doubts and my anxieties … My stories suggest lines of thought and prisms through which I try to scrutinize our society in depth. Commander Pauline Rougier, the main character of The Blackstone Conspiracy is an extension of each of us, a witness of our time, a character rooted in her time, modern, incisive. She is sure of herself, even though, like everyone else, she hides wounds and a fragility that sometimes surface when she contemplates a world that is becoming more and more incomprehensible. The French president always managed to keep a cool head, even when things weren’t going well. Considering what had happened over the last seventy-two hours, it would have been perfectly understandable he wasn’t able to on this occasion. Three days of escalating violence had seen suburbs being set ablaze and mass lootings in many of France’s city centers. The security forces had been overwhelmed, leaving the President no other option but to enforce a curfew and place the country under maximum security alert to ensure the safety of the people. The Head of State was monitoring what was happening from the safety of the Élysée Palace’s underground bunker. The high-tech, windowless control room’s walls alternated between wooden veneer and raw concrete. There was a glass-topped oblong table with steel legs in the center of the room, around which perfectly-aligned black leather chairs awaited the heads of government. A giant video screen dominated one end of the room, like an open window looking out onto a world beset by doubt and violence. The atmosphere was tense, the bunker full of red eyes and tired bodies. President Paul Lavalette and his Prime Minister, Henri du Plessis, were talking quietly. The other government members present were all sweating with worry. The operation’s commander-in-chief, General Lartigue, read communiqués that under his orders were brought to him the moment they were received. Lartigue was alert and focused as he questioned the liaison officers, whom he then sent away with his instructions. “Ministers, General, advisers. I thank you all for being here. Earlier today I declared that this country was in a state of emergency and asked for a curfew to be enforced, that would begin at 6 pm. “Mr. President,” Lartigue began as he stood up. He pushed a button on the keyboard that was on the table. A map of Paris and its surrounding area appeared on the giant screen. The President was interrupted. An image filled the screen. It was of La Défense, the business district of Paris, in the outskirts of the city. During the day, La Défense is populated by thousands of workers who emerge every morning from its underground train station like obedient little ants. Then, in the evening, it turns into an enormous, silent and lifeless space. Forty percent of France’s GDP is generated there; all industrial and financial powerhouses have at least some presence in the area. The district appeared on the screen, captured in its entirety by a camera on the Pont de Neuilly bridge. A concrete landscape on this cold, early autumn night. The Novotel hotel, with its broken-line architecture, concealed parts of the Tour AXA, in which only a few offices still had their lights on. Further left was the Tour Initiale, the stripped-down rectangle of a construction, whereupon light and shadow danced together to create a playful mosaic of black and yellow. In the background were more office blocks, most of them with all of their lights off. The buildings were huddled together, giving the impression of being one single entity. La Défense, which usually dazzled with a relentless clarity, seemed to want to hide itself. Down the promenade, hardly visible, stood La Grande Arche, the impressive modern architectural update of the famous Arc de Triomphe. La Défense, the symbol of French capitalism, needed to be protected. It was up to the 1st Light Armored Brigade to undertake that mission. Equipped with brand new VBMR Griffon armored vehicles, Commander Blin and his men were ready. Seven thousand soldiers were sent to twenty different locations. Five hundred seasoned fighters positioned at strategic points within the business district. A column of one hundred men had taken up position on the nearby Pont de Neuilly. Their priority was to watch over and defend the passage into Paris via the world famous avenue, the Champs Élysées, an almost mythically romantic symbol of French culture, lined with its fashionable shops and trendy cafés. The other main roads from the west and the north via Saint-Denis and Charles de Gaulle airport were also secured and closed to traffic. The silence was oppressive on this chilly evening. The curfew meant that the city’s noise, usually deafening in its relentlessness, had all but completely fallen quiet. Time itself seemed to stand still; an open bracket toward an unknown future. “Go ahead Blin,” replied Lartigue, eyes glued to the control screen. Quatre Temps was a giant, imposing shopping mall made of glass and steel located in the heart of La Défense. It was the largest mall in France, visited by over forty-six million people each year. If La Défense was the symbol of French capitalism, this place was its beating heart. A violent explosion in the distance made the members of the crisis team jump. The video feed showed debris, illuminated by enormous flames, being blown high into the sky. Nighttime seemed to disappear, the darkness swallowed up by the intense orange glow of the conflagration. Two more powerful explosions rang out, one after the other. The screen showed flaming tongues of fire and dense white clouds of smoke. At least one of the buildings had been attacked. “Sir, what should we do? It looks like we’re going to need to engage!” The soldier paused for a moment. The question that he was about to ask, and the answer it received, could change forever how France would be perceived by the rest of the world. This was the country that was famous for its role in the development of universal human rights, for Les Lumières, its role in the Enlightenment. He took a deep breath. “General, the enemy is getting closer. They’re making ground fast!” Blin regained his calm thanks to his experience as a soldier. “Mr. President?” Lartigue asked once more. President Lavalette closed his eyes and lowered his head. His shoulders were hunched over as if someone had just dropped a huge burden upon them. His right leg fidgeted awkwardly, a clear sign of the pressure he was under. Anyone could learn how to be a politician. With a good mentor, a little courage and a keen sense of communication, one might even make a career of it. Paul always wondered what difference there was between being a politician and a statesman, apart from just words and posturing. He was about to find out. He opened his eyes, composed himself, and nodded his approval to General Lartigue. Perched on top of his armored vehicle, Commander Blin looked over the scene that was playing out in front of his eyes. The glow coming from the Quatre Temps was increasing in intensity, a sure indication that the fire was spreading. Powerful flames pierced a sky covered by dense smoke clouds that were quickly dispersed by the strong winds. He could just about make out the river Seine, whose black waters intermittently reflected the silver rays of the moon. He took a deep breath and ordered his troops to start moving in the direction of the boulevard that encircled La Défense. Five other vehicles were to stay on the bridge in order to prevent any attempts by the enemy to cross the Seine and enter from the west, a maneuver that would give them open passage into Paris. The last video image transmitted to the Élysée control room was a convoy of armored vehicles beginning to move, followed by heavily armed men. In the distance, the first shots of automatic gunfire could be heard. The civil war had begun.